Hearts and Hibernian are in different leagues, but little else separates them. Although a derby match can be chaotic and unpredictable, it is certain that neither side is approaching this encounter in a state of self-doubt. The mood amongst the capital's football fans is buoyant. Even if Hearts have the advantage of being the home side, Hibs' victory over St Johnstone at Tynecastle in the Scottish League Cup semi-final last weekend was a timely fillip. Alan Stubbs' team is not in need of a dose of encouragement, not when their pursuit of Rangers in the Championship has been sustained so impressively and a midfield of some fine potential has been assembled. Yet the club's record at Tynecastle is poor, and still echoes with the old jibe that Hibs teams can lack mettle. In the last decade, Hibs have travelled across Edinburgh to face their rivals on 19 occasions, and lost 12 of them. There have been three victories, but few memorable moments. It is a reflection of their suffering that they have scored only 10 goals in those ties and conceded 28. The record is only a historical footnote to this game. Hearts have been vibrant, strong and powerfully intense at times this season, but Hibs are capable of defensive solidity and incisive attacking. There is intrigue, for instance, in how Hearts' back four - all muscle, vigour and defensive resolve - cope with the quickfire menace of Jason Cummings and Anthony Stokes. The signing of the latter has added creativity and purpose to Hibs' front line, as well as a surge of optimism since he turned down other clubs and has arrived at Easter Road with a renewed conviction. 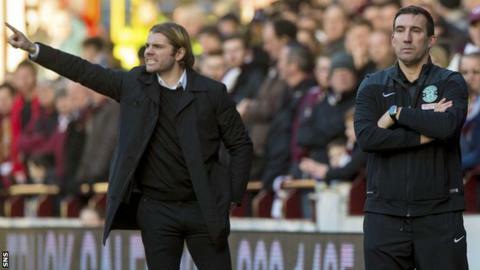 The tendency is to characterise Hearts as big and aggressive, while Hibs are slight and wily. These labels lack authenticity and ignore the depths of both sides. Nonetheless, if both teams can be considered to have midfields that have the right balance between dynamism, movement, passing and ruggedness, it is how the respective defences cope that will be key to the outcome. "When I was at Hibs, Hearts were always physically stronger than us," says Tam McManus, the former Hibs striker. "On occasions, we had more quality in our team, but they ran over the top of Hibs. They had strong players all over the pitch. "Robbie's team just now has a strong spine, they press really high up the pitch and force the other team to make mistakes. I watched them against Aberdeen in the last round and Hearts were superb, it was the best I'd seen them in a long time. "I can see Hearts doing the same thing, they'll want to get the fans behind them and put Hibs under as much pressure as they can, so it's up to Hibs to try to stay in the game and see that storm out, then once the game settles down a bit they can play their football. "Hibs are really strong mentally. They've been under pressure all season to try to keep up with Rangers. The game at Ibrox just before Christmas there, Rangers won deservedly, Hibs couldn't cope with the pressure that night. They'll have learned from that game. They're going to another hostile ground on Sunday and it will be a similar game." The likes of Stokes, Cummings, John McGinn, Liam Henderson and Dylan McGeouch provide Hibs with an sharp cutting edge. There is vibrancy to their play. They are also known quantities, and Hearts have similarly adept figures in Arnaud Djoum, Gavin Reilly, Prince Buaben and Sam Nicholson. There is also the additional threat posed by Abiola Dauda, the striker signed on loan from Vitesse Arnhem, who is robust, athletic and capable of adding a focal point to Hearts' intense, high-tempo play. There will be a period of adjustment, but the frantic nature of the derby match will be a test of their character. "The media is always very full of the game, so everything in special about this derby game. For a player, you probably give more," says Thomas Flogel, who was thrust into the rivalry as a Hearts player after arriving from Austria. "It's probably more difficult for the players coming from outside and playing in the game for the first time. They don't know what's happened, what happens with the media, and what happens if you lose the game. "In the game, you have to fight for every centimetre, and that was something new for me, coming from Austria to Scotland. I learned about Scottish football." Flogel used to play alongside the Hearts head coach Robbie Neilson, and he would recognise many of the qualities of the current side. Hearts have recruited shrewdly, adding height and presence to a team that was already deft, and since having raised the intensity of their play. On Sunday, two teams full of self-confidence and assertiveness will meet. That, as much as the fact that it is a derby game, makes it such an enticing prospect.